If Lyn Radford, Chair of the 2019 Canada Winter Games – Red Deer has a right hand man… it’s Hugh McPherson. You might say Hugh is of Hall of Fame caliber. After all he is an honoured member of the Alberta Sport Hall of Fame. Back in 2015 he was inducted as a multi-sport builder. 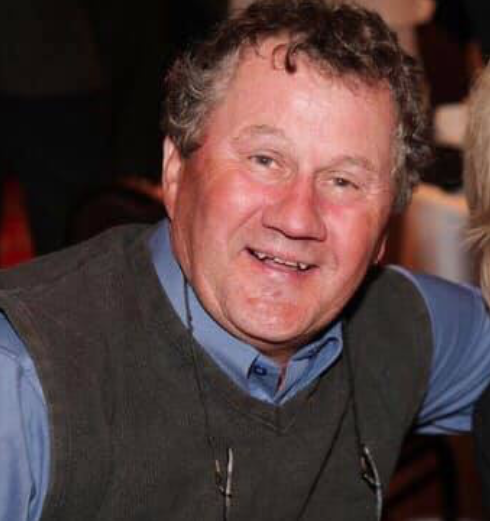 Before there was any talk of hosting the 2019 Canada Winter Games, Hugh put in years of volunteer work including a nice stretch on the Parks, Recreation and Culture Board during the time of the development of the Riverbend Recreation Area, and Bower Ponds… both are now home to Winter Games events. McPherson brings a wealth of volunteer experience to the 2019 Games. If you’re looking for someone to say thank you to for this outstanding experience and for the many legacy infrastructure projects that will enhance Central Alberta.. here’s a great place to start. So THANK YOU to Hugh McPherson, Vice-Chair of the 2019 Canada Winter Games, and another one of the great people living in our midst who helped bring the 2019 Canada Winter Games to Red Deer. Day 4 of personal thanks for the 2019 Canada Winter Games – Red Deer– Hugh McPherson – (tagged through his greatest supporter Lois McPherson) Hugh has contributed as many hours as I have and has been one of the greatest advocators and supporters to the huge Legacy work that has been done for 2019. His terrific wit, unending humor and ability to listen to me sounding off has gone a long way to helping me navigate the idiosyncrasies of an event this large! Thank you Hugh for taking this incredible ride with me, you have been a true friend! Two weeks of sport excellence and cultural celebrations wrapped up Saturday night with the Closing Ceremony of the 2019 Canada Winter Games in Red Deer, Alberta. Since February 15, over 3,600 participants, 5,000 volunteers and 20,000 visitors enjoyed 19 sports and 10 nights of cultural entertainment as part of Canada’s largest multi-sport and cultural event for youth. 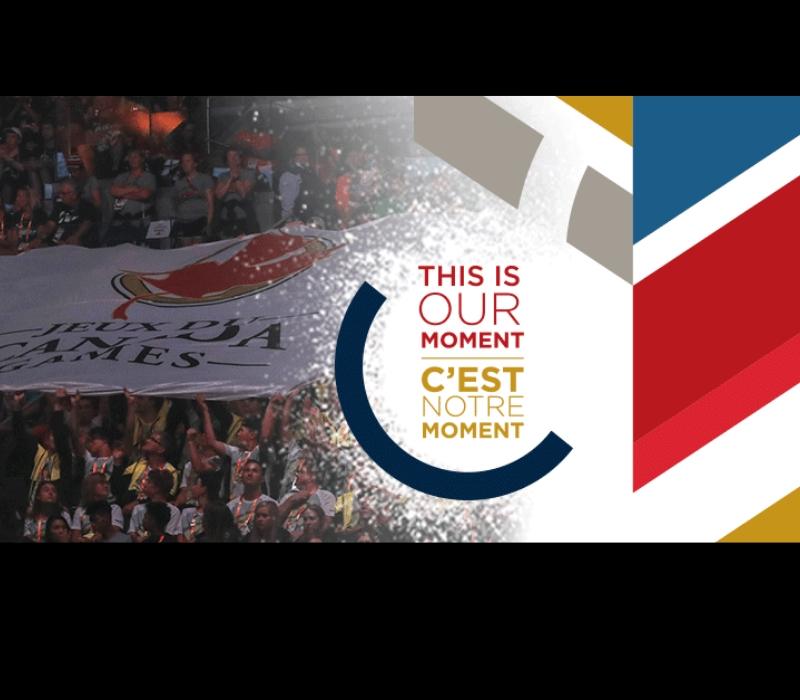 For more information on the 2019 Canada Winter Games, visit canadagames.ca/2019. Volunteering for the Canada Games has been inspiring! 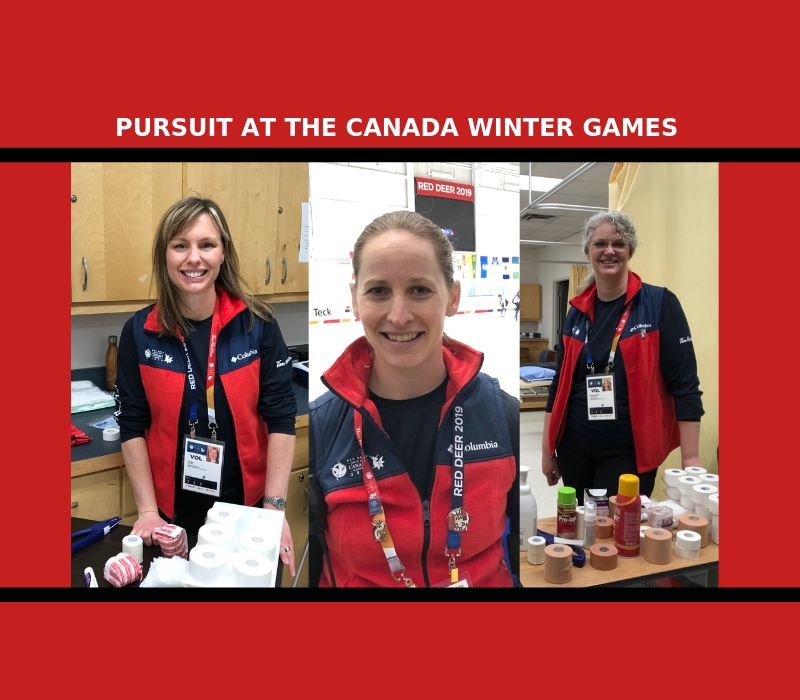 We’ve had an amazing two weeks volunteering as physiotherapists at the 2019 Canada Winter Games. All of us -Lynsie, Kara, Nicki and Leanne – we are tired but inspired! Through the 2 week period, we dedicated about 140 hours between us to assist the athletes. We have been working at the “polyclinic” where the athletes can seek treatment between training and competition. We are also at venues to assess injuries or assist with taping and such. We are having a great time and so pleased to be part of the Games. This is Our Moment! Enjoy the Games! We get asked a lot of questions when we’re out working in public like this so we thought we’d include some of them here for your convenience. You can find out more, along with contact information by clicking this link. How do I make an appointment for physiotherapy? Does my doctor have to refer me? Physiotherapists in Alberta are primary caregivers in our health care system. This means that you have direct access to physiotherapy without needing to be referred by your doctor. Anyone needing help to optimize their health can phone and book a physiotherapy assessment at our clinic. If you have a complex medical history or a specific medical concern, you may want to first see your doctor to rule out a medical root of your problem. I’ve never been for physio…what happens during a physiotherapy assessment? When you first attend our clinic, you will be asked for general information such as address and family doctor by our receptionist. You will then be taken to a private cubicle and introduced to your physiotherapist. Your physio will ask you questions about your injury/problem as well as your general health. You will then be evaluated regarding your specific problem. The therapist will look at such things as your posture, movement, joint and muscle mobility. This may require some disrobing so you may want to bring a tank top and shorts depending on the area being treated. Once the physical examination is complete, the therapist will explain your diagnosis and discuss the best treatment options. You will talk about your expectations and goals of treatment. Often a treatment is performed with the initial assessment, if time allows. You are always encouraged to ask questions as your understanding of the injury is crucial in allowing you to improve. You may be given a home program and plan for follow-up. What kind of training do physiotherapists have? Physiotherapists/Physical therapists in Canada have a bachelor’s degree or master’s degree in physiotherapy from an accredited university. Only therapists with these credentials are allowed to call themselves physio/physical therapists. After university, physiotherapists improve their skills through experience, learning from their fellow therapists, and by taking post graduate courses in areas of interest or towards specific skills such as manual therapy or IMS. Physiotherapy is a government regulated profession which means that we have a licensing body that is in place to protect the public. You can find out more about the regulation of physiotherapy through the College of Physical Therapists of Alberta (www.cpta.ab.ca). How do I pay for physiotherapy? Many benefit plans allow direct billing. This means that we will bill your treatment cost directly to your insurer for you. Some insurance plans to not allow this. If this is the case, we bill you for your treatment and you submit your invoice to your plan for reimbursement. We accept cash, visa, mastercard, and debit transactions. Do I have to do my exercises? Yes! While therapists at Pursuit Physiotherapy use their manual skills and other modalities to help you with your problem, your active participation in your treatment is crucial to your recovery. We do not pretend to fix people! We want to give you tools necessary to manage your problem. We are more than happy to teach you how to do that and use treatments such as manual muscle or joint mobilization, electrical or thermal modalities, needling, etc to help accelerate your recovery. How many times will I need to go for treatment? This varies considerably. Part of the philosophy of the physiotherapy profession is to give the patient tools to be as independent as possible in their treatment. We have you attend for treatments when you need hands-on care or regular follow up. We educate you on exercises and modifications in your movement or activities to allow you to continue to improve at home. We strive to have you back to your activities as efficiently as possible and do not believe that everyone requires frequent or ongoing treatment. Pursuit Physiotherapy in Red Deer, promotes balanced, healthy living through dedicated, individualized physical therapy for those in pain, unable to participate fully in their daily activities, wanting to maximize their function for work or sport, and wanting to prevent potential problems. If something is affecting your quality of life, then we want to help you to optimize your function and minimize your pain. We are located at 110, 2840 Bremner Avenue in Red Deer. Call us anytime at 403-356-9789.